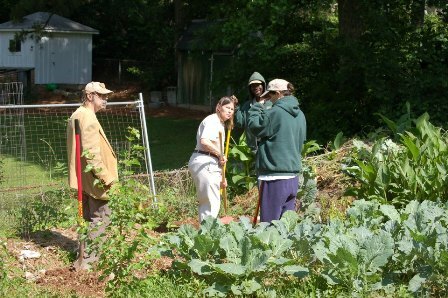 The gardening program provides opportunities to work, learn specialized skills, and engage with the natural world. All are invited to join in gardening activities, which include planting and seeding vegetables, annuals, and perennials in the greenhouse, maintaining a meditation path and woodland garden surrounding a 175-year-old red oak tree, and caring for a butterfly garden and the organic raised-bed gardens. The gardens provide fruits, vegetables, and herbs for our tables and flowers for the altar. Thirty varieties of heirloom tomatoes, all sizes and colors – red, yellow, green, purple, pink, and striped. Sweet peppers, hot peppers, eggplant. Perennial herbs and flowers, shrubs and trees. All organically grown. Our price list is below. Eight to ten gardeners work as employees. 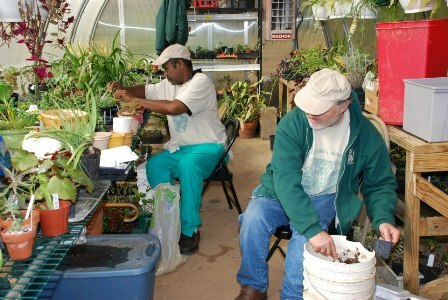 These employed gardeners learn basic work and leadership skills and receive an hourly wage. 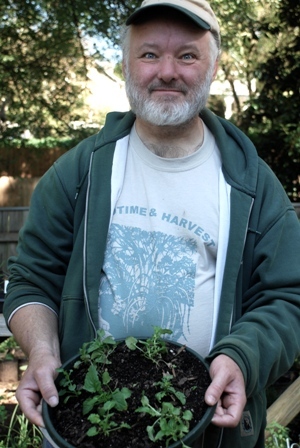 Along with leading weekly operations, the gardeners work at seasonal plant sales that are well attended by Holy Comforter’s friends and neighbors and occasionally attend special events or training. The greenhouse workers grow a variety of plants from seeds and cuttings for the gardens and for sale year round: vegetables, including our very own hot purple pepper "Holy Smoke," herbs, unusual annual and perennial flowers, groundcovers, shrubs, and indoor plants. Organic herb vinegars, dried herbs, and pepper sauce are also available seasonally. 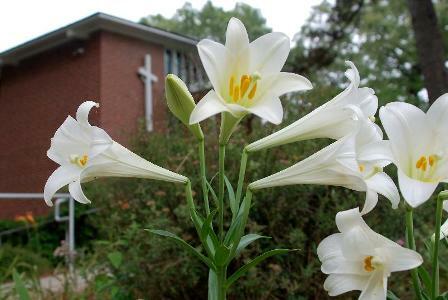 The grounds offer the church members and the neighborhood places of rest and reflection as well as expanses of lawn for play and flowers and fruits for harvesting.